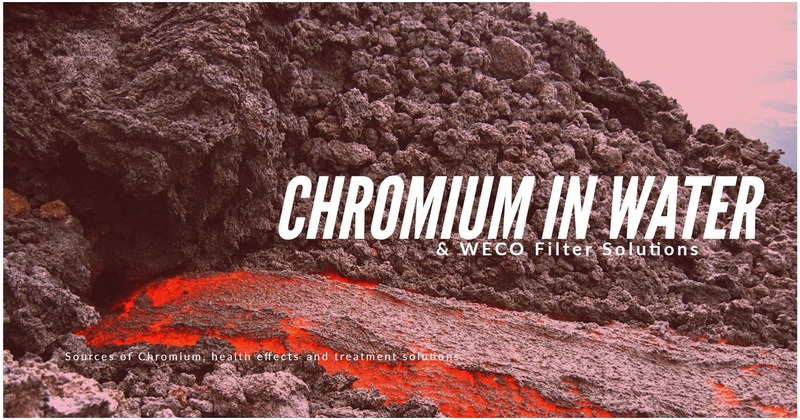 Source of Chromium: Chromium naturally occurs in rocks, soil, and in volcanic dust. It comes in several different forms, including trivalent chromium and hexavalent chromium. Hexavalent chromium, called Chromium (VI), is used in industrial processes, and has been shown to be a human carcinogen. Water supplies can contain chromium IV naturally or through contamination from landfills, factories, spills and improper disposal. Health Effects of Chromium: Investigation into health effects of drinking chromium-contaminated water is on-going. It is believed to be carcinogenic. The US Environmental Protection Agency has set the maximum contamination level goal (MCLG) in public water supplies for total chromium at 0.1 mg/L or 100 parts per billion (ppb). EPA enforceable standard for total chromium or the maximum contaminant level (MCL) is at 0.1 mg/L or 100 ppb. How to Remove Chromium: A WECO reverse osmosis system will remove chromium and other harmful heavy metals like lead and arsenic. Reverse osmosis also removes taste and odor problems, pesticides and organic chemicals like VOCs.